Radio broadcasting is a one-way wireless transmission over radio waves intended to reach a wide audience. 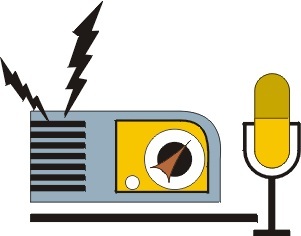 Stations can be linked in radio networks to broadcast a common radio format, either in broadcast syndication or simulcast or both. Audio broadcasting also can be done via cable radio, local wire television networks, satellite radio, and internet radio via streaming media on the Internet. The signal types can be either analog audio or digital audio. My radio station is better than yours!